It is made of one of the best foils in the world produced by Tervakoski Company in Finland. This capacitor do not make any unpleasant distortion on sound and do not "colour" the sound. It´s quality is long lasting. Tolerance about 5%. We are happy to have this very fine capacitor produced at a reasonable price level, and our sales figures of Jantzen Cross Caps are increasing every month. Capacitors are wounded of metallized polypropylene foil ZnAl. Front side of capacitors are sprinkled with Zn powder, which quarantees firm contact. Fronts are flooded with epoxy resin. The body of the capacitor is firmed by selfadhesive tape. The ends are made of tinned, round copper wire. Capacitor parameters are related to standard IEC 384-16. 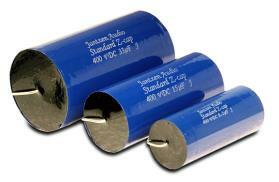 Standard Z-cap is an axial-type capacitor made from metallized polypropylene. specifically manufactured for audio application. The materials uses are chosen for best possible sonic results in its price range. Even standard caps are made to provide lowest possibly microphonic effect. The capacitors are available in a wide range of capacitance values with low tolerance. +/- 5%. The finish is a flame-retardant tape wrap. Finally. a capacitor at the state of the art in its price class! All Jantzen Caps are RoHS compliant. 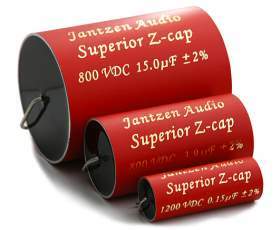 Jantzen Audio Superior Z-cap is an axial type made from metallized polypropylene, especially manufactured for audio purposes, utilizing materials for the best possible sonic results. To secure the excellent quality of these caps SUPERIOR Z-caps have high grade copper lead wires. Special equipment is used for winding Silver Z-caps, minimizing inner vibration and reducing microphonic effect to insignificant levels. The capacitors are available in a wide range of capacitance values with low tolerance, +/- 2%. The finish is a flame-retardant tape wrap, and the end of the caps is resin sealed to protect against humidity. Another key feature is, that our Superior caps do not need pre-aging. 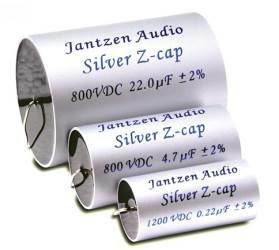 Jantzen Audio Silver Capacitors are an axial type made from metallized polypropylene. specifically manufactured for audio purposes with no need for pre-aging. 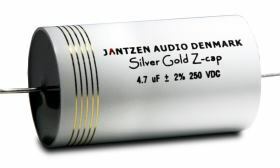 SILVER Z-CAP is the most detailed and smooth sounding Capacitor. Our Z-cap Silver has a special inner structure for improved listening experience. The materials we use are chosen for the best possible sonic results. To secure the excellent quality of these caps our SILVER Z-caps have pure silver wire leads. Special equipment is used for winding Silver Z-caps. minimizing inner vibration and reducing microphonic effect to insignificant levels. Capacitors are available in a wide range of values with minimum tolerance. +/- 2% The finish is a flame-retardant tape wrap. and the end of the cap is resin sealed to protect against humidity. All Jantzen Caps are RoHS compliant. 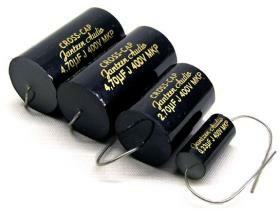 Jantzen Audio Silver Gold Capacitors are an axial type made from metallized polypropylene. specifically manufactured for audio purposes with no need for pre-aging. SILVER Z-CAP is the most detailed and smooth sounding Capacitor. Our Z-cap Silver/Gold has a special inner structure for improved listening experience. The materials we use are chosen for the best possible sonic results.